When visiting one of the world’s most prestigious paradises, the island of Bora Bora, Pearl of the South Seas, the happy traveler soon gets disappointed in his luxurious overwater bungalow, as he is awoken by the smells and engine roars of the passing boats at 5 am in the morning. This is the time when the daily boat traffic starts and transforms the tranquil peace of an overwater bungalow into living like next to a boat highway. The idyllic island of Bora Bora has more than 50 outboard and diesel powered excursion and shuttle boats that need to be fed with more than 2 million liters of imported fuel, every year. 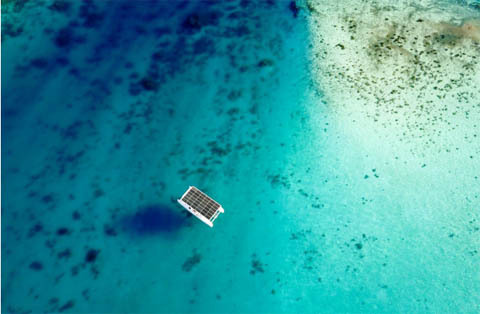 Green pioneers Luckily, the Ministers of French Polynesia are setting fresh objectives by introducing a fully sustainable alternative under a privileged tax exemption: the SoelCat 12, a fully solar electric boat designed by Soel Yachts. The electric catamaran takes their guests on a truly sustainable and noise-free tour in the lagoon. 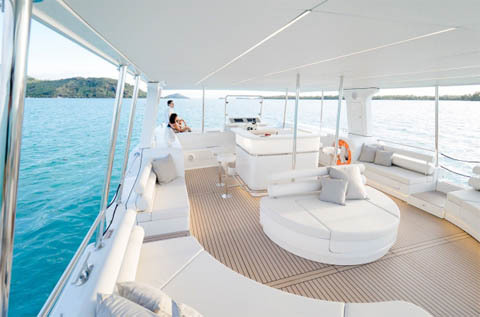 The first SoelCat 12, which is called ‘Okeanos Pearl’ is a cooperation project between Soel Yachts, the Okeanos Foundation for the Sea and the Bora Bora Pearl Beach Resort. Together they boost the meaning of sustainable sea transport with unique PR values for the destination. The Pearl Beach Resort sets a pioneering example for the worldwide tourism industry, by introducing a new experience on the water and a new definition of true eco-tourism! The silent electric boat turns into a powerful grid-feeding station, whenever the passenger vessel is not in use for solar cruising. Up to four households can be supplied with 15kVA of inverter power from the SoelCat 12. This enables the resort for example to use the solar electric boat to power their desalination plant: the power from the SoelCat 12 can produce up to 4000 liters of fresh water every hour. A smart solution to save on imported fuel and in addition to that utilizing green energy for on-water and on-land applications! Highest efficiency by integral design From the first line drawing, every aspect of the solar electric boat has been designed for its purpose: efficient solar electric propulsion. The same approach is used by Tesla for its electric cars: “one cannot just take any existing hull shape, add an electric motor and hope that it achieves a range of 150 nautical miles” explains Linda Brembs, managing partner at Soel Yachts. With its efficient hull lines, the SoelCat 12 requires only 2.17kWh of battery capacity per nautical mile. When compared to the specific energy density of gasoline, the boat's consumption would be the equivalent of only 0.22L of gasoline per nautical mile. With a battery capacity of 120 kWh, the SoelCat 12 offers a range of 60 nm at 8 knots, and this is even without the need for any sunshine. Once the sun starts to shine the vessel’s cruising speed of 8 kts is prolonged to 8 hours. Lowering the speed to 6.5 kts results in a 24-hour range. The integrated boost mode allows higher speeds and let’s the electric boat quickly accelerate to 14 knots. With both the Okeanos Foundation for the Sea and Soel Yachts sharing the vision of sustainable sea transport, the Okeanos Foundation funded and supported the development of this remarkable project. Okeanos is committed to empower island nations by providing sustainable sea transportation and implementing a network of fossil fuel-free vessels in the Pacific. The first catamaran of the SoelCat 12 series, called ‘Okeanos Pearl’ sets a real working example for sustainable passenger transportation and will pave the way for more sustainable coastal water vessels in many different sectors. “Tourism's dependence on fossil fuel is problematic, especially in remote areas. Shipping fuel to those remote places is very costly and vulnerably to supply chain disruptions. 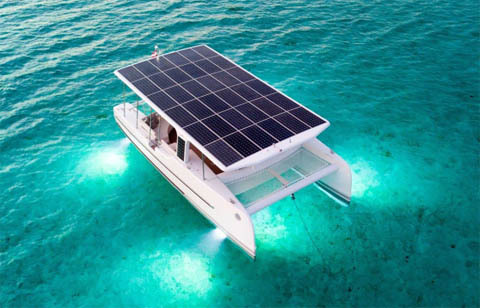 So in the interest of the boat operator, the solar option is much more resilient” according to Susanne Becken, Director and Professor of Sustainable Tourism at the Griffith Institute for Tourism.